You can use the Developer Studio Text Editor to create a text file from scratch using any language. If the file you create contains an executable procedure, you can run it directly from the Text Editor. See Running a Procedure From the Editor. You also can create a text component in a Procedure using the Other component. Choose Text Editor from the Command menu. In the Open dialog box, enter a new file name in the File name box. For a file other than a procedure (.fex) or a Master File (.mas) include an extension. Choose a file type from the File of type list. For a procedure (.fex) or a Master File (.mas), the file extension is picked up from this selection. Click the Open button. The Text Editor opens. Type your text and close the Text Editor. When prompted, save your file. The new file is saved in the selected folder with the appropriate extension. 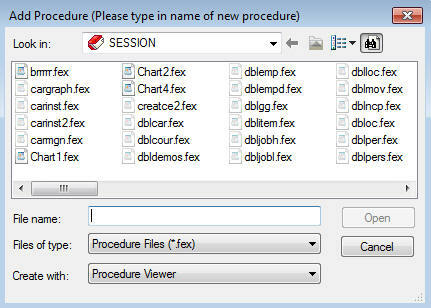 Select Procedure Viewer from the Create with drop-down list. Click a component connector (yellow diamond) and select Other from the menu. Type your text and close the Text Editor. When prompted to update the procedure (FOCEXEC), click Yes. Save and close the procedure.